I’m working on a TV-sofa quilt in pink inspired by a quilt I saw online. It’s a lot of work but fun. While I’ve been spending time with mom in her sewing room we are both creating a lot of different small projects. I took my flowery tote outside to take these photos with my mom’s compact camera, and as you can see spring was coming around with flowers and hope for summer. Then just one day later it started to snow and it’s been snowing a lot during Easter too. The weather is strange, but it’s a good thing when the sky is gray on a day like this, you don’t need to feel bad when you stay in mom’s sewing room making log cabin pillows and carving stamps! More about that soon. Now I’m off to have coffee and watch a movie in bed. This entry was posted in A Creative Life, Fabric & Sewing. Bookmark the permalink. Woooow kanon flot taske!!!! Den er noget smukkere end mine!! :):) Du kan virkelig noget med farver! I love that fabric! So festive! 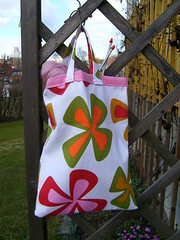 I love the bag…very bright and cheery, and funky. Can’t wait to see the results of stamp carving!! 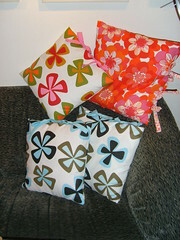 Beautiful fabrics, great job! 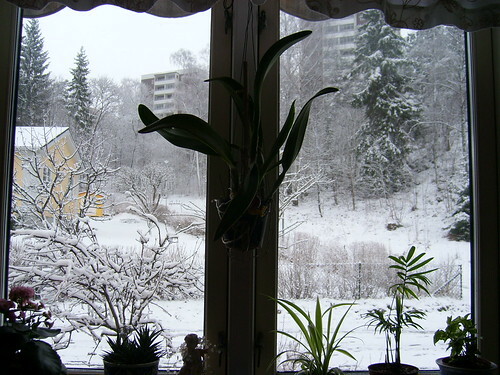 We had snow too, it’ not a very springy Spring yet. 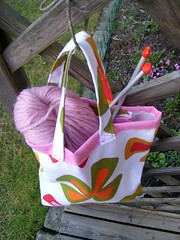 Love the tote. Am jealous of the snow. It is beautiful here, today, but it’s just been so blahhh with no nice snow to show for it all winter long. Virginia really has no idea what climate it wants to be in so it wavers all winter long. Drives me nuts.